“I wanted to make sure that I got to the event fully prepared,” he says. But Mr. Carr won’t get to the 100-miler at all. Last month, his ankle sustained an over-use injury during a workout, sidelining the Rancho Cordova, Calif., project manager for a vision-benefits company. Roughly 10% of athletes preparing for an endurance event are training too hard, estimates Jack Raglin, director of graduate studies at the Indiana University’s department of kinesiology. 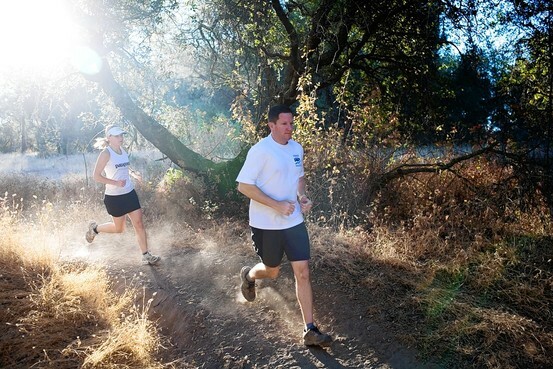 Research in the field has shown that injury rates rise as runners increase their weekly mileage. Besides injury, excessive training can contribute to or cause major depression, loss of sleep, anorexia and sometimes death. “The overtrained athlete is so fried by race time that he either performs very poorly or can’t perform at all,” says Dr. Raglin, who specializes in overtraining problems. A more-is-better mentality permeates the endurance-exercise culture. Novice runners in particular tend to think that finishing a marathon requires no end of training. In fact, however, under-training is rare. After all, more than 95% of marathon starters reach the finish line. Statistically, the harder line to reach is the start line. Of the tens of thousands of Americans who pay as much as $180 to register for marathons, as many as 25% fail to make it to the race. Injury, illness and loss of motivation as a result of overtraining are major reasons for this. 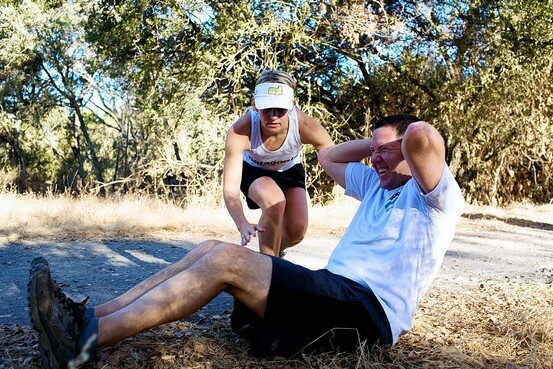 Coach Julie Fingar guides Bill Carr on abdominal exercises to break up the pounding intensity of running. But moderation is a hard message to promote among runners determined to reach extremes. For such athletes, no matter how conclusively science may prove the value of rest and recovery, the culture of endurance sports lionizes those who seemingly never rest. “In running circles, there is huge pressure to do big mileage, to do the big training, to do the biggest races,” says Sandra Ross, a 47-year-old runner in Auburn, Calif. It also can be difficult for runners to know when they are training too hard. One red flag, sports-medicine specialists say, is an intensifying obsession with performance. Exercise, after all, is supposed to be stress-reducing, and amateur competitions by definition are recreational. Yet marathon fields are populated with runners who are visibly stressed out about whether they’ll set a personal record or win their age group. To head off overtraining, some coaches urge athletes to remain alert for the point at which greater doses of exercise cease to produce improvement. Ms. Ross, the California runner, says that for years she would suffer injuries while training for marathons. To help pace herself, Ms. Ross hired Ms. Fingar, the running coach, who enforced rest days, cross-training and trail-running as a lower-impact alternative to pavement. The discipline paid off, and this summer Ms. Ross completed a 100-mile race. That accomplishment wouldn’t have been possible if she hadn’t resisted the impulse to match the weekly mileage of her younger running partners, she says. “If I ran as much as they do I’d be faster. But as an older runner I need more rest, and I also have a child, a husband and a career,” says Ms. Ross, who works as an environmental consultant. “I was diligent about cutting down the calories and increasing my workout schedule. The pounds fell away and it seemed to result in better racing,” recalls Ms. Bjorklund, who says that soon after setting a Pikes Peak Marathon record she entered a hospital near death from anorexia. “It is easy to think that if a little is good, more should be better. After a period of time, however, I would always crash and be forced to cut back,” the 53-year-old wrote in an email. Ms. Fingar says she tries to set an example for her clients. She refrains from aerobic exercise one day a week. Often, if she listens to her body instead of her mind, “I’ll realize that I’m tired and I’ll take another day,” she says. When training for an ultramarathon, Ms. Fingar runs about 70 miles a week, far fewer than the 100 miles that many other ultramarathoners log weekly. But unlike some other runners she is rigorous about cross-training weekly in the pool, on a bicycle and in yoga and Pilates studios. She says this training offers a break from the monotony and physical pounding of running, and provides flexibility, enhanced aerobic fitness and a strengthening of core muscles. “Especially with trail running and endurance events, you need upper-body and core strength to ascend and descend the hills,” she says. This article is something I can really relate too. I always get caught up in the idea that “less is more”, but I know that is not always the case. When you love running as much as I do and you are seeing improvement at the same time, it is mentally hard to think “I need some rest” or “Maybe I should take it easy today”. Sometimes when you are in the midst of training, your competitive side can take over and just push you over the edge. Sometimes you don’t realize you are full blown overtrained until it is too late. Too much training can lead to a multitude of problems, including injury, overtraining syndrome, and mental burnout, all of which I have experienced. What might be too much training for one person, might be perfectly acceptable for another person. You have to experiment with how much training your body can handle, but once you find that happy medium, it makes training a heck of a lot easier. LISTEN TO YOUR BODY! When you are tired, take a day off. It has taken me over a year to figure this out, but recovery is the only way to become the best you can be. Overtraining is very serious. It can really wipe you out both mentally and physically. I hate to admit it, but I have been there and it’s not pretty. It really takes a toll on your body and it takes some serious time to recover from. To sum things up: Pushing yourself too hard does not make you a better runner.